The Fortinet 50A is a firewall router designed for 10 users or less (this is an older model, now replaced by the 50B). Out of the box, it is configured as a NAT DHCP device at 192.168.1.99. I simply plugged my Mac Powerbook into the Fortinet's "internal" port, refreshed my TCP/IP, and was able to use a browser to connect to the firewwall. The browser configuration is easy to use and had no surprises. I could have also used ssh - I really appreciate having a command line interface available. After changing the mode to "transparent" and assigning an ip within my actual network, I repatched this so that it sat between my existing router and my switch - "internal" port to my switch, "external" to my router. Fortinet thoughtfully provides a crossover cable that I used for the external port (while most switches have autosensing ports nowadays and need no crossover, a router may not). At first I thought it wasn't working - I was dead in the water. However, this was just reboot and initialization delay, within a few seconds everything was up and runniing. In this mode, the Fortinet is simply inspecting packets as they go in and out of my network. However, its default rules allow all traffic to pass, so nothing changed for me. 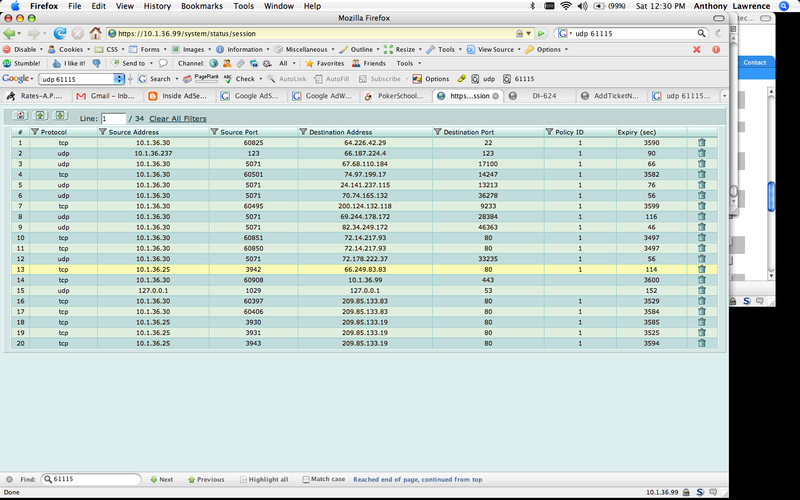 However, I now had a clear view of all network activity as it all had to pass through the Fortinet. Clicking into the details of current sessions showed me a screen that looked something like this. Obviously most of the traffic is just web browsing sessions (80 as destination port). Other ordinary traffic includes udp 123 to 66.187.224.4; that's just one of my Linux boxes updating from "clock2.redhat.com". But what the heck were all these connections from udp 5071? Well, that's OK, I am playing poker on-line (actually waiting for a game scheduled for later), so nothing to worry about there. But something that has always bothered me is what's going on when I'm not looking? The Fortinet can help with that. I can define a policy rule that blocks ALL traffic, but is applied only at night after I've gone to bed. From 10:00 PM to 6:00 AM, absolutely nothing can flow through the Fortinet after applying this rule. Of course I could be a little less draconian: I could allow clock updates or any other traffic I need. Note that you don't need to worry about locking yourself out of the administration browser accidentally; the Fortinet is smarter than that. Policy rules can also use "protection profiles" that inspect and provide more complex protection. This can include subscription services such as anti-spam and web filtering. Fortinet offers various services like this; availability varies by model. There are network configurations that can't work in transparent mode; see Asymmetric routing and other FortiGate layer-2 installation issues for a deeper explanation of these conditions.